The bench of Justices UU Lalit and Navin Sinha asked the CBI to give its response by the first week of January. 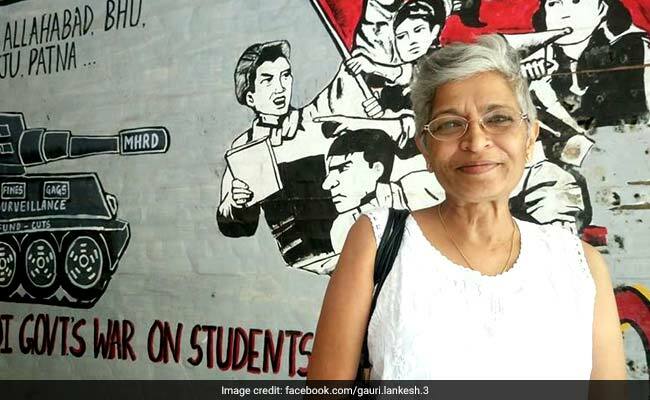 Journalist-activist Gauri Lankesh was murdered outside her Bengaluru home last September. The Supreme Court today asked the Central Bureau of Investigation (CBI) to investigate the murders of Kannada academician MM Kalburgi, journalist-activist Gauri Lankesh, social worker Narendra Dabholkar and rationalist Govind Pansare if it can find a common link between them. A bench of Justices UU Lalit and Navin Sinha asked the CBI to inform it by the first week of January why it should not investigate all the four cases if they appeared to have a common link. The status report of the Karnataka police pointed at such a possibility, it added. The central agency is already probing the Dabholkar murder case. In the last hearing, the Supreme Court had pulled up the Karnataka government for "fooling around" instead of investigating Mr Kalburgi's murder. This time, however, the state police assured the bench that the chargesheet in the case will be filed in three months. The top court is set to take up a petition filed by Uma Devi, the wife of Mr Kalburgi, for a special investigation team (SIT) probe into the case. Ms Devi, in her petition, alleged that there was a common link between the murder of her husband and the killing of Mr Dabholkar and Mr Pansare in August 2013 and February 2015 respectively. Mr Kalburgi (77), a former vice-chancellor of Hampi University, was shot dead outside his Dharwad residence in broad daylight on August 30, 2015. Last month, a state-constituted SIT probing the murder of Ms Lankesh had named Hindu right-wing group Sanatan Sanstha in its additional charge sheet filed before a Bengaluru court. According to the document, the group believes in targeting prominent people opposed to their ideology. The first charge sheet was filed in May, eight months after 55-year-old Gauri Lankesh was shot dead near her residence at Bengaluru's Rajarajeshwari Nagar on September 5 last year.